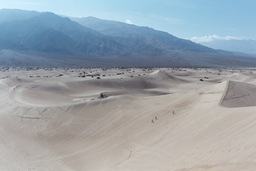 Death Valley National Park is located in east-central California, right on the border with Nevada. It is one of the most interesting places to visit in California. No matter what direction you come from you'll be struck when you enter the valley as the landscape will change from High Sierras to desert and the view of the valley like a vast emptiness with the mountains in the background is just breathtaking. Death Valley holds a number of records like being the lowest (282 feet below sea level) and hottest place in the Western Hemisphere. The valley has a lot to offer and is a great place for photography. Think about it... Canyons, craters, bright colors, sand dunes, good looking ruins, grand views. For those seeking solitude, it is the perfect place. Even if some attraction points might seem a bit crowded, if you leave those behind within a few minutes you'll find yourself completely alone. We visited Death Valley three times, first time in October 2001 and then again in February 2003 and June 2004. Before the first trip, I read on the web that is best if you carry water with you at all times so I bought a cooler and filled it with ice and water. That proved to be extremely useful. It's not that it was very hot (it was October so I imagine August is worse), it's the fact that it was incredibly dry. So dry that we felt the need to drink water continuously. It was ok as long as we stayed in the air conditioned car, but when you got out, it was like getting hit by a hammer: we were knocked out by the heat! I can't begin to imagine how it will be if you visit in August (which I don't recommend). Second time we visited Death Valley in February and it wasn't so hot and dry.